• 250 sq. 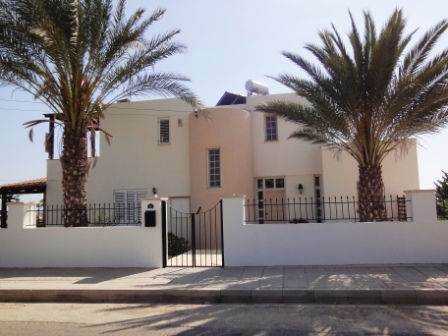 m., 5 bath, 5 bdrm 3 story - €620,000 EUR - Title Deeds - NOW SOLD! Emba, Paphos, Cyprus - This spacious family home is located in the rural belt between the villages of Emba and Chloraka, and is within a few minute’s drive from the sea, and from Paphos Town. It is a home with real character, with the villa being designed on 3 levels. To the left of the entrance hallway is an open plan living area, including lounge, dining room and end kitchen with breakfast bar. Many windows and patio doors on all sides make this area a nice light and airy space. To the right of the hallway is a double size bedroom with en-suite shower room, and a guest cloakroom. The hallway has a built-in cloaks cupboard. From the living area, a staircase leads up to a landing with wood paneled ceiling, off which is the master bedroom, 2nd bedroom and large family bathroom. The spacious master has fitted wardrobes, and large picture windows with sea and country views. There is space to add an en-suite if required. The 2nd bedroom also has fitted wardrobes, and patio doors opening on to a good size balcony, again with sea views. The bathroom includes a separate walk-in shower, bath, and double sink unit with fitted cupboards, and has access to a large balcony. From the central hallway downstairs, a staircase leads to the lower level accommodation which features a utility room, two bedrooms, bathroom and separate toilet. This space is ideal as staff or guest accommodation, or for older children who want their privacy. The outside is also impressive with wonderful views, a large swimming pool with roman steps, and a huge patio terrace with two separate pergola seating areas. A large covered terrace off the lounge and kitchen/dining area provides an ideal setting for outdoor dining. The driveway at the side of the property leads to the rear of the house and can accommodate many cars. Here there is a large storage room, and access to the level level accommodation. Steps lead up to the pool terrace.